It is Stanley Cup playoff time in the NHL. This normally means quite a number of selfies from Carrie Underwood in support of her husband, NHL player Mike Fisher. Fans are curious, in general, about any new selfies from Underwood after she suffered a painful fall last November. Underwood is considered to be one of the most beautiful women in country music so her fans were alarmed when she announced the fall. Her injuries included a broken wrist and over 40 stitches in her face thanks to a gash around her upper lip. According to Underwood, she was taking her dogs out when she tripped after missing a step. She tried to catch herself but was unable to stop herself from taking a tumble. 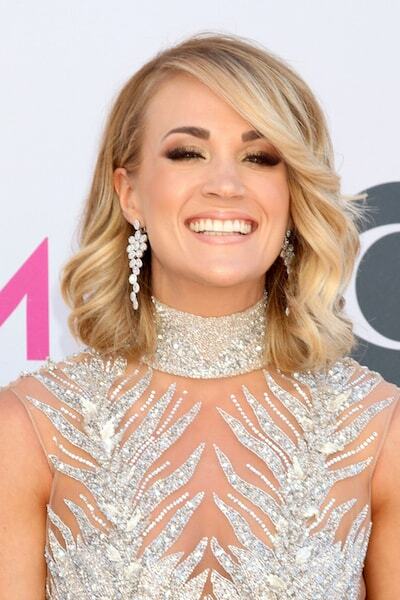 While the resulting scar was not noticeable during her recent appearance on the ACM Awards, it was easily seen during a videotaped radio interview as part of the “The Bobby Bones Show”. After suffering the fall, Underwood warned her fans that, when they saw her next, she would not quite look the same. Bones pointed out that, to the average eye, Underwood did not look any different than she had in the past. Underwood has been very open about coming to terms with the changes to her appearance. She told Bones that one of her main worries was that her son would be scared of her after the fall. She also noted that, in her own words, she has been “very fortunate in the healing process”. At the time the accident happened, she didn’t know how she would end up looking after the scar healed. During the Bobby Bones interview, she remarked that she was “at a point where I didn’t know how things were going to end up. I didn’t know what was going to go on. I didn’t know what it was going to heal like.” She was also worried that she would run into fans at the supermarket who would ask her “what happened” to her face and that they would post a photo of her appearance on social media. Injectable fillers – can fill-in the depressed area and improve the contour of the scar surface. This is normally a temporary solution and will need to be repeated on a regular basis. Laser Resurfacing – A high-powered laser removes the scarred top layer of skin and also promotes smoother and tighter skin. Laser resurfacing options include CO2 lasers that penetrate deeply into the skin, YAG lasers that treat shallow scars and fractionated lasers that use tiny beams of light to penetrate the skin and stimulate collagen production. Non-ablative lasers heat the inner skin layer, while leaving the surface untouched, to promote collagen production and new skin cells. Dermabrasion – A wire brush or diamond wheel (with rough edges) removes the scar tissue through scraping. Chemical Peels – A chemical remove the top layer of skin and reveals skin that is smooth and healthy. Scar Removal – Surgery to remove the scar uses a tissue substitute or skin graft to close the incision. Janice21 on What is a Scar?